Happy Tuesday, sweet friends! I hope that your week is off to a great start and that you are staying cool in these warm summer temperatures. Today, I am excited to share my summer sunroom with you. This room is my happy place where I start my day watching birds and sipping tea. In fact, if I am not careful time will slowly slip by! This room is part of a large space that also houses the kitchen and breakfast areas. I love this space because it has high cathedral ceilings and lots of windows. When we remodeled the kitchen, the sunroom received a little makeover. A pony wall separated this space from the breakfast area. It drove me nuts! Mr. Bleu told me, if I wanted to get rid of the wall, now was the time. I quickly took him up on his offer! Peonies and a Majolica plate create a simple vignette on the coffee table in front of the toile love seat. It had rained shortly before I photographed this room. All at once, the sun shined brightly casting brilliant rays of light into the room. An orchid, blue and white pieces, and more Majolica create this side table vignette. This room is filled with things that I love and have collected over time. The little antique pink footstool was an estate sale find. It had such a pretty needle point floral pattern on it, but it had a horrible black stain. I didn’t pay much for the piece and planned on recovering it. However, once I got it home, I really hesitated recovering it. Instead, with nothing to lose, I decided to try some upholstery cleaner I had on hand. Guess what? It worked!!! I was able to save that beautiful floral needle point pattern! My favorite Charles Faudree red toile chair found its way into the room. After all, it pairs well with the Charles Faudree love seat that I bought at a previous estate sale. You can never have too many chairs!!! The pony wall once stood behind where the red chair stands. In an upcoming post, I’ll reveal more details when I show you the breakfast area and butler’s pantry. Thank you for your visits and the gracious comments you post! I hope that you have a blessed and wonderful day, dear friends!!! Shannon, this sunroom makes my heart sing. It is stunning! I love the toile sofa, it is perfect in your sunny space. The furniture and chairs are spot on for that French style. The needlepoint stool was a great find, so glad you could clean the spot. Your vignettes with the majolica are so pretty. Kudos for a beautiful room my sweet friend. How I would love to join you for a cup of tea! Thank you so much sweet friend, and you are always welcome at my house! I would love to share a cup to tea with you! I love everything about your sunroom! All of the wonderful windows, the toile everything! I agree with Penny and Pam. I love it all and I just gasp every time I see your wonderful Charles Faudree red toile chair. Goodness, it makes my heart happy! Your room is perfect and you did a marvelous job with every detail! Thank you so much, Susan, for the very sweet words!!! What a lovely room- I now I’d be in there frequently! Your arrangement and furniture pieces look so inviting. I like all your accents especially your favorite collected pieces. The matching upholstered chairs are identical (except the fabric) to one I had from Ethan Allen that is at my mother’s now. It has held up remarkably well and I hope to have it back in my home some day. Liz, you are spot on about the chairs…they are Ethan Allen. My mother in law gave them to me, and I had them recovered. They are really nice chairs and quite comfy. Thank you for your sweet comment!!! Beautiful!! I love the pattern on pattern-and color! Thank you for the very sweet comment, Joann! I hope that you have a wonderful week!!! Lots of Old World charm here….reminds me of why I love toile and plates, everywhere! We must be kindred spirits, Sandi! I don’t think you can every have too many plates. They are the perfect decorating accessory, and toile is timeless! Thank you for your sweet words! Enjoy your week!!! Your sunroom would be my happy place too! You have such good light and views to your back garden. It has such a happy feel with your furnishings and accessories. Glad that wall could come down. Your new house has been perfect for you, now all personalized and beautifully styled. Thank you, Bonnie, for the very sweet words!!! Your sunroom is so pretty! Love your French country style! You accesorized with lovely collections. Thank you, Nancy, for your very sweet comment! I hope that you enjoy your week!!! What a wonderful area you have created. I understand how your passions makes your heart pitter patter. Those windows are so beautiful. Thank you so much, Jane, for the very kind words! I hope that you enjoy your week!!! What a pretty room, I can see why you like sitting there in the morning! You can never have too many chairs! Love everything here! Thank you, Angelina! Enjoy your week!!! Oh I am in love! Your sunroom is gorgeous! Your French style is superb! This room just speaks to my soul! It’s everything a space should be and more! So gorgeous!!! I love all of the color, fabrics, furniture and accessories! It’s really just PERFECT! Can I say that I want everything in here!😘 I kind of feel that way about your whole home! Lol! Seriously adore! I think this may be my favorite so far!!!!!!!! Such a pretty cozy space Shannon, I would let time slip away there too! What a beautiful sunroom. The couch is so perfect for the space for friends or family to sit and enjoy special times together or just visiting any day of the week. This is absolutely the most beautiful room I have ever seen!! I just can’t quit admiring the pictures! You have done an awesome job and I soooo appreciate your sharing with us! I am looking forward to your new post about the details. Shannon, I’m in love with your sunroom! It’s so gorgeous! Hello, Shannon. I’m thrilled I ran across your posts! Your home is lovely and it’s certainly obvious that you put much thought and love into your decor:) I’d like to ask you about your kitchen/sunroom floor. I really would like the old world look of stone or brick, but comfort certainly is important. I just can’t tell from your pictures if your floors are tiles, pavers, or faux. Would you mind sharing? 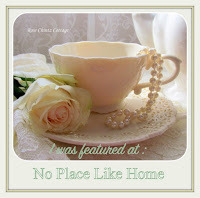 Hi Sandy, I am so happy that you found my blog and stopped by for a visit! Thank you so much for your sweet words. The kitchen floor is actually a ceramic tile, but you would never know it. It is a non slip tile that looks and feels just like brick. It is made by Marazzi USA, and the pattern is Urban District Downtown. I really wanted something timeless, and this fits the bill. Both my husband and I have been really happy with the flooring. Thanks again for your kind comments, and I hope that you are having a wonderful week.